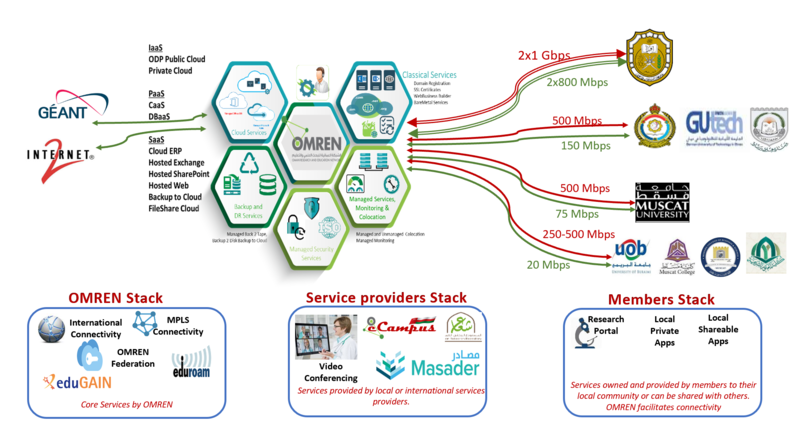 National Research and Education Networks (NRENs) around the world provide critical high-bandwidth connectivity to research and educational institutions for the purpose of having collaborative research and education services (e.g. online virtual libraries, virtual labs, telemedicine, grid computing, cloud computing, high performance computing, video conferencing …etc). NREN’s members create bridges for virtual collaboration between themselves locally and globally with their distributed communities and peers. IT networks are now fully integrated into higher education’s core operational and are essential to its research mission and growing in importance of its overall mission of teaching and learning. Nevertheless, colleges and universities are not only focusing their efforts on the basic requirements of having reliable, scalable, secure, adaptable, and fault tolerant networks, but are also further leveraging their networks to strategic ends. They are using networking capabilities in diverse and creative ways to enhance institutional competitiveness and facilitate strategic goals. Oman Research and Education Network (OMREN) is an Initiative by the Research Council (TRC) to establish such a national network for Oman. OMREN aims to partner with Research & Education Sector through providing world class e-infrastructure to their practical needs. OMREN works with a vision to enable innovation, research, education, strategic and International e- collaboration for the research and education community of the Sultanate of Oman. As part of the Research Council initiatives to promote scientific research in Oman, it has established a strategic partnership with OmanTel, the national telecommunication service provider, to build, operate and maintain this national research and education network. OMREN will support its members to consume and produce knowledge, increase research capacity and innovate ideas, patents and products.This will promote scientific research in Oman and will foster enhancing the Sultanate of Oman leading role in the region.A steering committee consisting of members such as SQU, MOHE, MOMP, private Universities, TRC, ITA, TRC, Oman Broadband Company and Omantel will be governing the project and provide the road map to its future direction.